Roadsides, fields, and disturbed ground everywhere. A very important and variable crop plant, long cultivated and first collected in Michigan in 1859 in Washtenaw Co. Apparently a human-selected tetraploid hybrid of uncertain origin, widely naturalized. 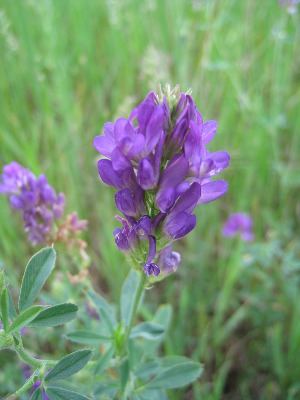 The corolla of typical alfalfa is blue-purple (white in albinos), and the fruit is coiled at least 1.5–2 times at maturity. A yellow-flowered alfalfa with straight to C-shaped fruits has been called M. falcata L. or treated as a subspecies of M. sativa. It has not been collected in Michigan (although one cannot be certain of yellow-flowered plants lacking fruit). Our relatively frequent yellow-flowered plants are hybrids, which have been called M. ×varia Martyn. Insofar as they have fruit, they are indeed intermediate. The corollas may also be blue-green or variegated. MICHIGAN FLORA ONLINE. A. A. Reznicek, E. G. Voss, & B. S. Walters. February 2011. University of Michigan. Web. 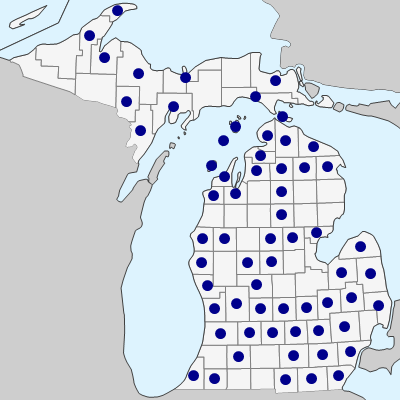 April 18, 2019. https://michiganflora.net/species.aspx?id=1332.